This was the first sourdough bread recipe I ever came up with. I loved the idea of Jalapeño Cheddar Sourdough Bread because as I’ve mentioned before, everyone in my family loves spicy food. The cheese is just an added bonus! 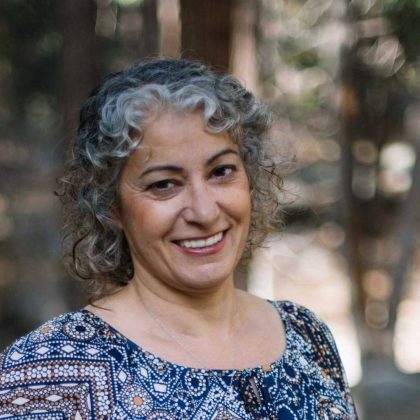 This is another one of those recipes that I had on my Assyrian cookbook website and forgot to transfer over to this blog. I am finally getting around to transferring it. But you know what they say, better late than never! Before you can make amazing Jalapeño Cheddar Sourdough Bread, you need a good sourdough starter; an equal mixture of water and flour, left in a warm environment to capture wild yeast. The starter is then fed more flour and water at regular intervals to help it develop further. The longer the starter is maintained the better it gets and the deeper and more complex the flavor becomes. Should You Buy or Make Your Own Starter? 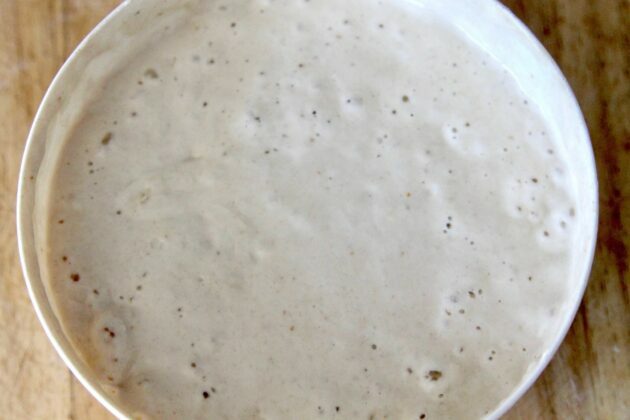 It’s easy to find sourdough starter recipes on the internet. However, if you don’t want to deal with the hassle of making your own, you can purchase it pre-made online; some claiming to be over 100 years old! Being adventurous, I decided to make my own starter, which was in January of 2017. As it has matured over the months, it has developed that classic sourdough flavor. If you like baking bread, you may also want to try my other sourdough bread recipe. 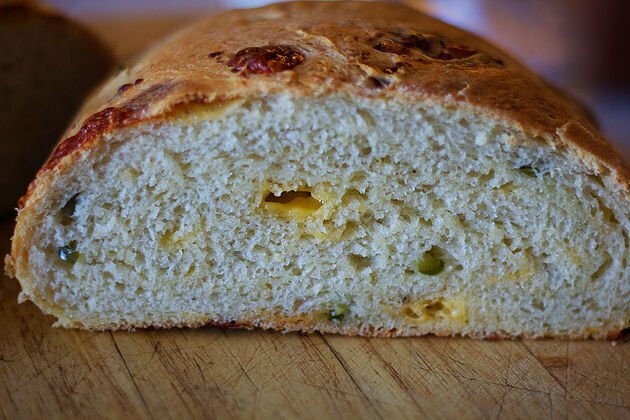 Delicious and easy to make jalapeno and cheddar sourdough bread. Place one cup of flour in the bowl of a stand mixer. Add sugar, salt, and yeast, and mix to combine. Add water and butter to a measuring cup. Microwave for approximately 30 seconds, or just long enough to soften the butter, and warm the water. Pour water and butter over the other ingredients in the bowl. Add sourdough starter, and mix on medium until combined. Continue to add flour, 1/2 a cup at a time. Mix after each addition. The dough should to be slightly sticky. Knead for five minutes. 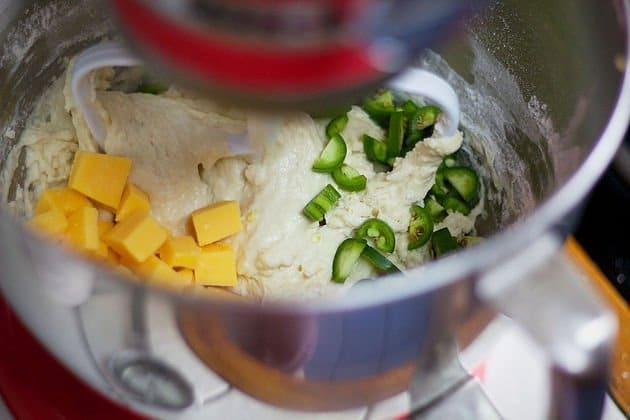 Add cheese and jalapeños to the bowl, and mix on low. Over mixing will cause the cheese to disintegrate, which is not your goal. 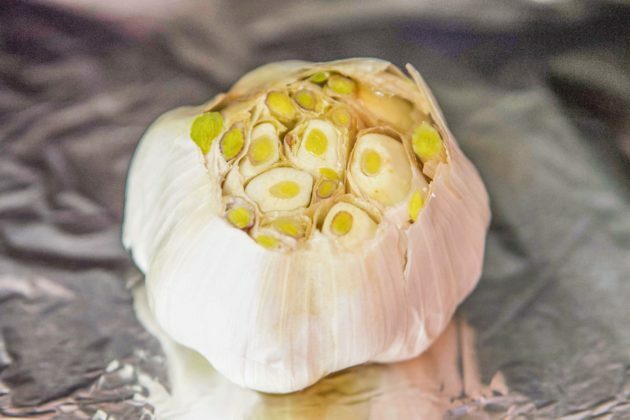 Cover and allow to rise for 2 hours, or until doubled in volume. After a few hours, the dough should have risen significantly. Since the dough has jalapeños in it, you might want to wear some latex gloves for the next part, or you can be like me, and live on the edge! 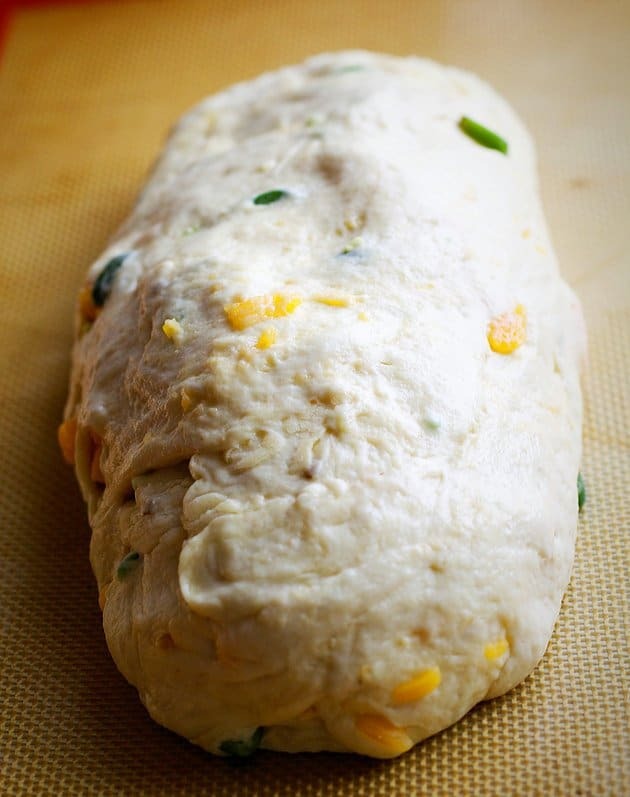 Punch down the dough, and form into a loaf. Place on a baking stone, or a baking tray that's covered with a silicone mat or parchment paper. Another option is to form the dough into a ball and place into a well floured banneton basket. Either way, cover the dough loosely and place in a warm location for one more hour. After an hour has elapsed, preheat the oven to 375 degrees F. When the oven is ready, make a few slits into the top of the loaf. Bake for 30 to 35 minutes, or until nicely browned. If you used a banneton basket, carefully invert the basket over a lined tray to release the loaf from the basket, then follow the steps mentioned above.